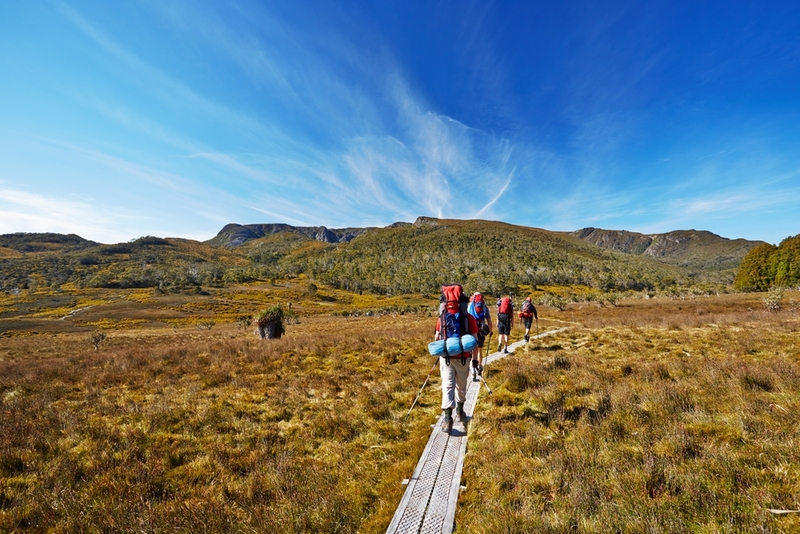 The rugged landscape of Australia is home to dozens of wonderful bushwalking tracks. The land of the country is diverse and full of untouched beauty. These walks will take you adventuring through the outback, over mountains and through wilderness. You will feel like an intrepid explorer, the first person to walk these trails. This walk leads you through Tasmania's lush and gorgeous wilderness, which as been World Heritage-listed. Your hike will take you to the top of the completely beautiful and rugged peaks of Cradle Mountain, to picturesque rivers, falls and lakes and on to the grassy plains and meadows of the highlands. The calm and crystal clear waters of Dove Lake are a great place to take a breath and rest your feet. On this walk, you will encounter a range of native bush and wildlife, including wombats, wallabies and birds. Sleep in one of the many simple huts or beneath the expansive sky of stars at one of the many campsites in your sleeping bag. The trek will last 6 days and will cover 65km of terrain from Cradle Mountain to Lake St Clair. There is an option to do short day walks from the Cradle Mountain Visitor Centre and Dove Lake. For 4 days you will traverse 54km of majestic rainforest. As you walk along the rim of the ancient Tweed Volcano that is slowly being eroded by icy streams and waterfalls, you will feel like you've been transported to a land before time. The trees are wound together with vines, palms and ferns, like the setting of a fantasy novel and the trees are full of life, being home to birds and other animals. Along the way you will see the wonders of Lamington and Springbrook plateaus – both of which have been listed as World Heritage Sites. You will also see Egg Rock and Turtle Rock in the fantastically beautiful Numinbah Valley. Woonoongoora Walkers Camp is known by the local Yugambeh people as 'Queen of the Mountains' and is rich with stories of myths and legends of how the land came to be. Now is a good time to check out this walk – the best times are March to October when temperatures are more mild. This mighty track covers a massive 965km and can take up to 60 days. You can however choose to cover smaller portions, which only last a couple of days. There are huts and camping sites all the way along the tracks. Across the massive expanse of land, there is every kind of terrain imaginable. The tracks wind through forests that have been there for centuries, peaceful stretches of farmland and right down to the untamed beaches. One highlight of the walk, and a popular destination for day-trippers, is Mt Cooke, which is the highest point of the Darling Range and will give you amazing views of the land around you. The vineyards and orchards of the wine region, Blackwood Valley is another wonderful point to pause enjoy your surroundings. Beedelup National Park is full of waterfalls and wildflowers, and the Pingerup Plains is known for its large granite boulders. The Valley of Giants is so named for its massive trees that will tower over you and Peaceful Bay is a place steeped with a calming atmosphere. From June to September you will see whales migrating from Albany. If you want to spend your holiday adventuring in Australia's lush outback, going on a walking track or hike is a great way to do this. However long you want to go for, and whether you feel like going for a hike or a more gentle stroll, there will be something for you.